Spicy Cranberry Meatballs are the single easiest appetizer for entertaining. 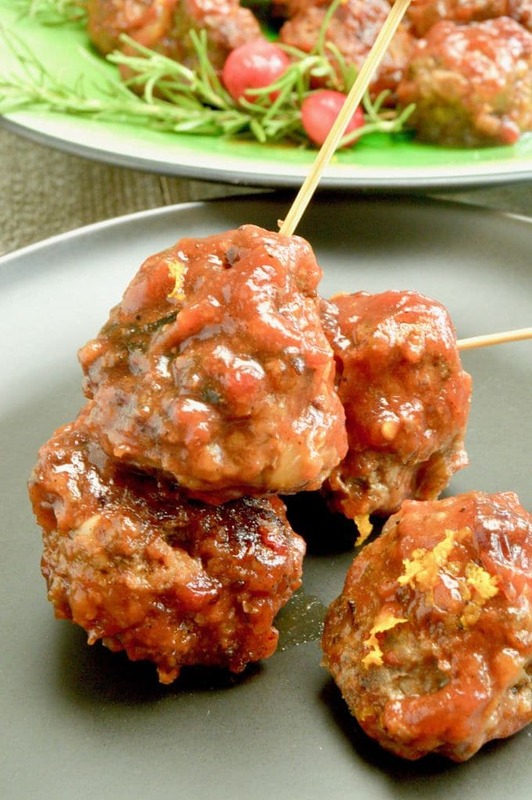 Tender meatballs slow cooked in sweet cranberries with hints of orange and a little heat. 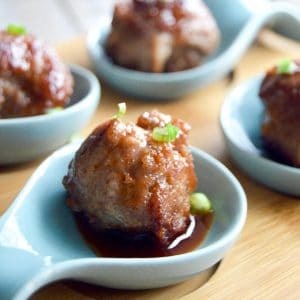 Meatballs that will have all your guests asking for more! 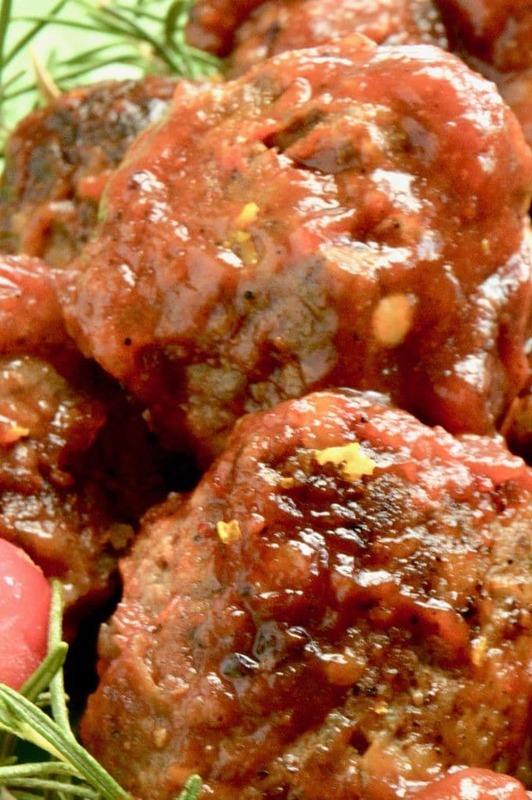 Todays recipe for Spicy Cranberry Meatballs are super easy to make. If you’ve followed me for a while, you know Im kind of obsessed with meatballs. They are the perfect appetizer for entertaining. 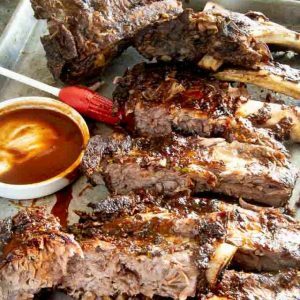 I love them because you can offer several different options at a party, whether it be for a Holiday party or a game day celebration. With crazy times I often use some leftover frozen meatballs from other recipes Ive made …..(I know that sounds like something impossible, but I usually make double and triple batches of meatballs so I can just thaw and use them when we have unexpected guests.) A really great base meatball is the one in my recipe for Cheesy Gouda Meatballs! If you use that recipe them just leave the cheese out because this recipe works best with a basic meatball. The other option is to use a store-bought frozen meatball. Gasp, yes I said it. While I believe anyone can make great tasting food better from scratch, sometimes, like during the holidays I will reach for the bag of meatballs I bought from IKEA. I use 2 pounds of them when making this recipe. The frozen meatballs are already cooked so you can mix in the ingredients for the sauce and then pop them in the crockpot for entertaining. 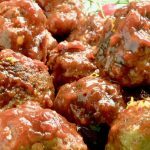 Im giving you the option in the recipe for Cranberry Meatballs below as to which works best for you. I pulled out some of my homemade leftovers for the recipe in the photos, but don’t worry too much about using store-bought this sauce has so much flavor with the cranberry sauce, chili powder and sirarcha you are fine using store bought ones if you don’t have the time during the holidays. You can mix them in the crockpot too… like I did here. If you are looking for recipes to have at a game day party… (bowl games, Super Bowl watching parties et al) I have these Buffalo Chicken Meatballs which are a much healthier way to have a variation on chicken wings. I also have a bacon wrapped Blue Cheese stuffed meatball that will please all the bacon lovers in your house! If you are looking for lots of other recipes to make for company or just to have your own Friday Night party at home please follow me on Pinterest or Facebook for all kinds of ideas. Or if you prefer, sign up for my mailing list below to get updates when new recipes come out! Join the mailing list if you want to make delicious recipes to entertain family and friends without stress! Thaw meatballs for 30 minutes. In the bottom of a crock pot, (stove top directions in notes.) mix all in ingredients except for meatballs. Mix until well combined. 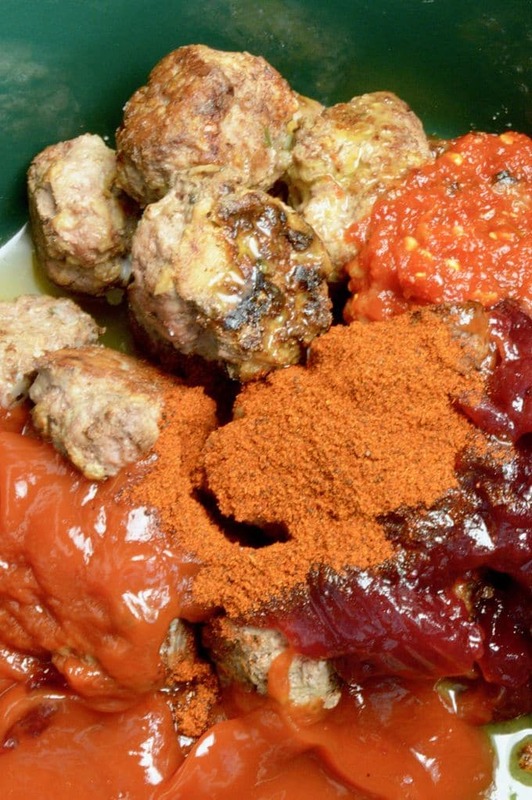 Dump meatballs over the top of sauce and stir to coat. 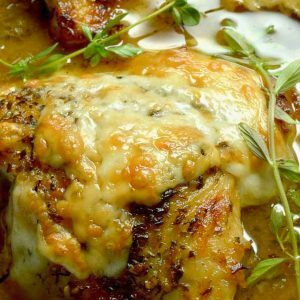 Turn Crockpot to high and cook for 60 minutes. If making meatballs on the stove top, mix ingredients in the bottom of a large pan that will hold 2 pounds of meatballs. Then add meatballs and stir. Turn heat to medium high and warm for 20-30 minutes until meatballs are heated throughout and sauce has slightly thickened. I love that these are made in the slow cooker, such a perfect stress free dinner or appetizer! Maybe this will be the recipe that will get my family to love cranberry sauce. I seem to be the only one that loves them and I always have a ton of cranberry sauce left over after thanksgiving. This will be so perfect since like you I always have meatballs in the freezer. I would never think of using cranberry sauce as a sauce for meatballs! I would have guessed it would taste too sweet but I guess the sriracha cuts out that sweet flavor. Great idea! I used to buy a lot of IKEA meatballs way back when I was living in Russia. Believe me, they taste just like US bought! ;) I like how easy and time saving your recipe is! 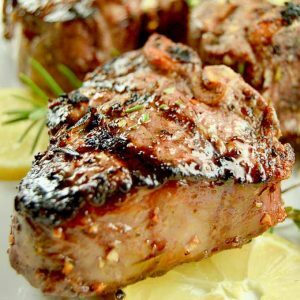 Such a great idea to add cranberry to this recipe! Looks so delicious. Perfect for this holiday season! I will never berate anyone for buying ready-made food to make entertaining easier. You added your own special touch to the IKEA meatballs and they look delicious! I could make a meal on the appetizers!! Great recipe. I looooove the cranberry orange flavor combination. A perennial favorite, especially this time of the year! This is just the perfect appetizer to serve when entertaining. It’s good that they are a bit spicy. The spice would offset the sweetness perfectly, I should imagine. And they sound really easy, especially of you buy ready made meat balls. Ah delish! I love the color on these from the sauces. Chilli garlic is my absolutely favorite so this one is my kinda recipe. I just love the idea of pairing cranberry with spices and meatballs for a savory party offering! I would love to serve a big pot of these if I do a holiday party this year – pinning for sure! I love the chili garlic sauce, and I’m sure that this combination of flavors will have just the right amount of heat to it. I love that these meatballs have some Gouda in them. YUM!